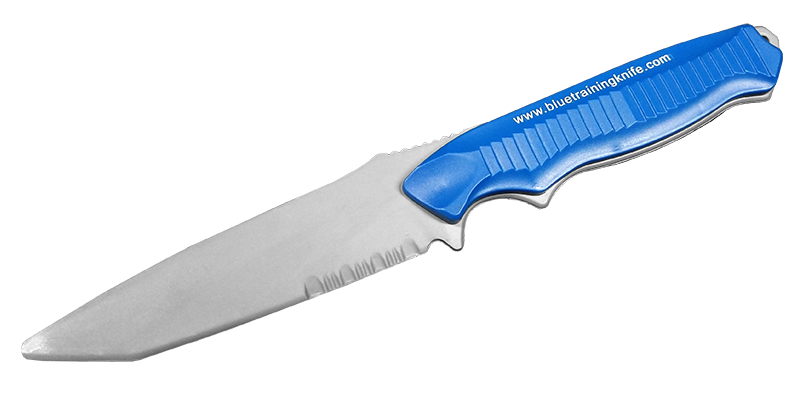 Blue Training Knife is custom designed to look like a folding knife with the blade locked open. 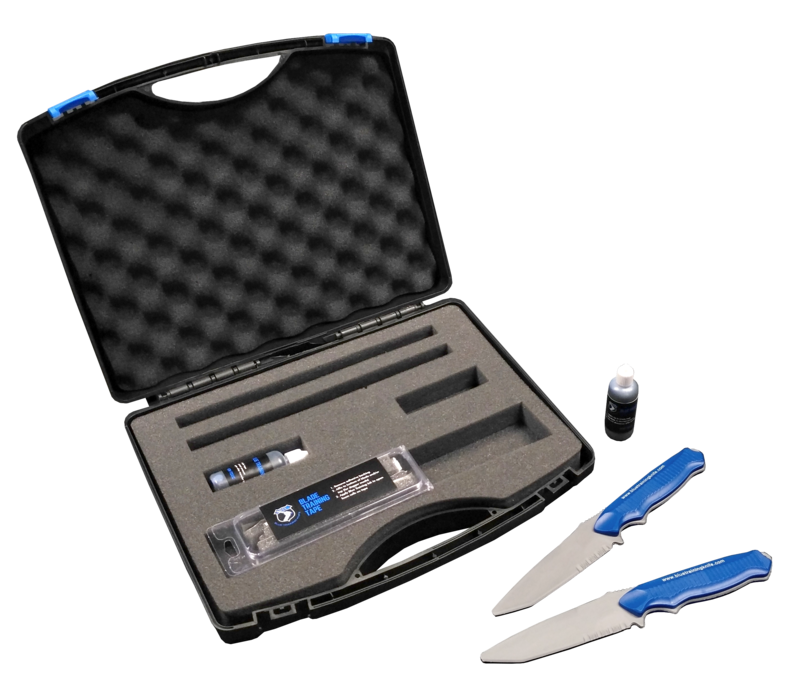 It has a blue handle with logo to signal to the instructor/student that the knife is for training (such as other reality based equipment: blue gun; blue baton; blue OC pepper spray canister etc). The blade is manufactured to a specific pliability (durometer) that allows it to “fold”and/or “twist” when it makes contact. The resultant greater surface area and deceleration dissipates the impact energy over a broader surface which is safer for the recipient than with a smaller/harder surface area (increased penetration potential). BTK can be used “dry” where the students practice their skill sets and form motor programs to defend against an edged weapons attack. It can then be used “wet” to indicate where the knife has touched the other person. To do this, simply attached the open cell foam strip (one-sided adhesive) to the edge of the blade from the tip to the front guard (quillon). To simulate a daggar-type blade, simply place another strip on the spine of the blade from the tip to the jimping (notches near handle). Then apply the blue temporary marking fluid to the foam. It is best used on a white shirt or light colored martial arts Gi. On dark clothing or bare skin, the liquid will show as moisture marks indicating contact. The blue “ink” will disappear on its own after about 30 seconds and then the water will evaporate quickly allowing for a clean slate to start again and again! The “ink” is non-permanent, non-staining and non-toxic. BTK can also safely be used by role payers to be held out as a knife during a scenario as it is very life-like looking when brandished in context as opposed to some other unrealistic looking training knives such as wooden or hard plastic. Can be used “dry” to practice skill sets or It can then be used “wet” to indicate where the knife has touched the other person. Lightweight and flexible. The blade is manufactured to a specific pliability that allows it to “fold”and/or “twist” when it makes contact. Low potential for injury. “Wet” method uses “ink” that is non-permanent, non-staining and non-toxic. Allows the user to immediately see where the blade has made contact with their training partner. 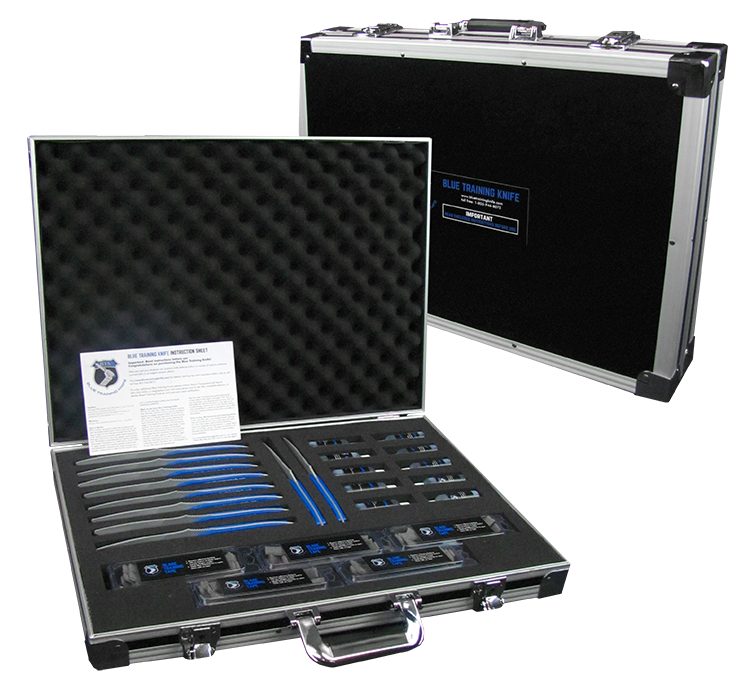 The marking ink will quickly disappear on it’s own so there is no need to wash or remove “cut marks” thus increasing training time as a “clean slate” is reset on its own every time! Easy-grip handle. Very life-like looking when brandished in context as opposed to some other un-realistic looking training knives such as wooden or hard plastic.